Rating: 89 percent based on 686 votes. 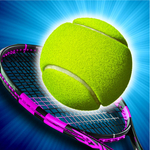 Description: Crazy tennis is a fun tennis game with cartoon graphics. Select your player and compete in a tennis tournament where you try and come out on top.